About 50,000 people from Romania and Bulgaria will come to the UK every year when restrictions are lifted next year, think tank Migration Watch suggests. It predicts this level annually in the five years after controls on worker movements end, warning of "significant consequences" for housing and jobs. Citizens of both countries will have free movement across the EU in 2014. 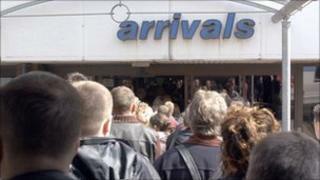 Ministers say calculations are difficult but the Home Office said it was working to cut net migration. Prime Minister David Cameron said earlier this week the detail for such calculations "wasn't there yet". The Home Office said it wanted to move from hundreds of thousands to tens of thousands of migrants by the end of this Parliament. From next year, like other EU citizens, Bulgarians and Romanians gain the unrestricted right to live and work in the UK where currently, they require authorisation before taking a job. Migration Watch has a good track record analysing future population trends so its latest forecast should be taken seriously - though it acknowledges there are many imponderables and there could be 20,000 fewer annual arrivals from Bulgaria and Romania than its headline estimate. Nevertheless, in the absence of any official government figure, the Migration Watch research is the best we have got so far. There are internal Whitehall figures - but ministers do not want to release them in case they are wildly inaccurate. If the predictions turn out to be too low ministers will be accused of being ill-prepared; too high and the critics will say they alarmed people. But as the clock counts down to 1 January 2014 the government will come under increasing pressure to put a figure into the public domain. Migration Watch, which supports tighter immigration controls, said its study suggested its estimates could be considerably higher if there were to be a movement of Roma people to the UK or if some of the nearly one million Romanians resident in Spain and Italy moved to Britain. It said Germany and the Netherlands were "likely destinations" for Romanian and Bulgarian migrants because their youth unemployment rates were lower than other EU countries. But it said the UK, with youth unemployment at 20%, "is nonetheless an attractive destination, partly because of its flexible labour market and partly because of the ease of access to its benefits system". Sir Andrew Green, chairman of Migration Watch said: "It is not good enough to duck making an estimate of immigration from Romania and Bulgaria. It is likely to be on a scale that will have significant consequences for housing and public services. "It will also add further to the competition which young British workers already face. "We have therefore produced our own estimate as a contribution to an important debate which must include the ease with which migrants to the UK can currently access the welfare state." It analysed migration from other European countries and the number of Bulgarians and Romanians already in Britain before making its estimates. Sarah Mulley, of the Institute for Public Policy Research (IPPR) think tank said that although it was "very difficult to predict migration flows with any degree of confidence in these circumstances" the estimates put forward by Migration Watch "look high". She said: "The UK is opening access to its labour markets along with the rest of Europe and the process of opening up to Bulgaria and Romania has been a gradual one, in contrast with 2004 when the UK was the only large EU country to open its labour market and when borders and labour market access were opened at the same time. "So it would be very surprising if net migration from Bulgaria and Romania was on the scale predicted by Migration Watch." Temporary curbs on Romanian and Bulgarian migration were imposed by the Labour government in 2005 to protect the UK labour market. The Labour Party has said it would support any moves to extend the measures. But Home Secretary Theresa May said in November temporary curbs could not continue under EU law and the government was looking instead at limiting access to benefits and the NHS to reduce the "pull factors" that encouraged migrants to come to the UK. Last weekend, Communities Secretary Eric Pickles warned an "influx" of Romanians and Bulgarians would add to the existing housing problems in the UK. But he refused to give an estimate of the numbers of people who might move to Britain after getting the right to live and work in the UK in December, saying he did not want to start a "scare story" and that more work had to be done on drawing up a robust figure. The government's migration advisory committee has also said there is evidence that Bulgarians would move to Britain because of its stronger economy, and it was "plausible" Romanians would come for the same reason. The Home Office said: "We are working to cut net migration from hundreds of thousands to tens of thousands by the end of this Parliament and our tough new rules are already taking effect with overall net migration falling by a quarter in the past year. "In terms of European immigration, we are working closely with other government departments to look at the pull factors that may encourage EU nationals, including those from Bulgaria and Romania, to come to the UK. "The government has made clear it will always apply transitional controls on new EU member states and will continue work to cut out abuse of free movement."